On April 27, 2004, President George Bush signed Executive Order 13335 establishing the position of the National Health Information Technology Coordinator. Six years, a recession, a change of administration, a couple of major legislations and a multitude of billions of dollars later, the Office of the National Coordinator for Health Information Technology (ONCHIT) is finally on the road to delivering on the original vision behind that executive order. The stated mission of ONCHIT, as reiterated in the HITECH Act, was the creation of a nationwide interoperable health information technology infrastructure that makes pertinent information available at the point of care, improves health care quality and coordination, reduces health care costs and disparities and does all that while protecting privacy and security. While the 2004 executive order did not go into much operational detail, the HITECH Act provided instruction on the structure and strategy for building the HIT infrastructure. It is interesting to note that the HITECH Act is comprised of two Titles; Title XIII in Division A which outlines the activities expected from ONCHIT and Title IV in Division B which creates the Medicare & Medicaid stimulus incentives to eligible providers. The notorious “Meaningful Use” term appears only in Title IV and only as a prerequisite for stimulus incentives from CMS and is loosely defined by certified technology, electronic prescribing, information exchange and reporting on clinical quality measures. Additional guidance is provided on the selection of clinical quality measures to be in accordance with Section 1890(a) of the Social Security Act, which awards CMS $10 million every year for contracting development of such measures. Meaningful Use seems a rather benign litmus test for CMS to administer prior to dispersing any stimulus incentives. So why is it that “Meaningful Use” became the defining substance of the ONCHIT mission? From the first meetings of ONCHIT (or ONC for short), Meaningful Use was seen as the centerpiece for the definition of a roadmap to that elusive nationwide interoperable health information technology (HIT) infrastructure. Meaningful Use Stage 1, Stage 2 and Stage 3 were presented as the milestones on the roadmap to success and, as such, ONC assumed an active role in defining the various Meaningful Use stages. Basically, the interoperable HIT infrastructure is not defined according to the capabilities it must have, but instead it is defined in terms of what users of the emerging infrastructure must achieve in order to obtain incentives. This was largely hailed as a wonderful approach. Instead of just building standards and tools to facilitate a nationwide information exchange, we first mandate what we want to exchange, how it should be recorded, who should record it and where it should be reported, and only then do we build the infrastructure to support our mandates. We then throw in some cash and some penalties just to be sure that if we build it, they will indeed come. Sounds very reasonable, except who is “we”? Now that Stage 1 of Meaningful Use has been largely put to bed (a few minor adjustments not withstanding), ONC is turning its attention to Stage 2 and perhaps Stage 3. Presumably there will be more of what Stage 1 required, many of the capabilities required in Stage 1 will morph into requirements for actual execution, more data will need to be captured and actually exchanged, more standards will be defined and more clinical performance measures will need to be reported. And just like Stage 1, it seems that ONC is leading the charge for Meaningful Use, instead of CMS who will end up just publishing the requirements. No surprises here, except a brand new workgroup of the Health IT Policy Committee chaired by Dr. Blumenthal himself – a Quality Measures workgroup. There is already a Clinical Quality workgroup in the Health IT Standards Committee, so I was intrigued by the policy aspects of quality measures and ONC’s need to address them. From listening to the first meeting of the Quality Measures workgroup, it seems this is a group of well-intentioned and very talented folks trying to figure out what clinical indicators should be required for Meaningful Use Stage 2 and Stage3 reporting. The main considerations cited in this meeting were parsimony and HIT-sensitivity; parsimony, in the sense of few broadly applicable measures and HIT-sensitivity in the sense of measures best enabled by EHR technology. The entire conversation (transcribed here) is most interesting. The ONC workgroup is aiming at thoroughly examining work done by traditional quality measures builders, such as NQF, and coming up with its own recommendations to support various health care and health care policy goals. The discussion ranged from how clinical measures should support sustainability goals of federally funded Health Information Exchanges (HIE) to their ability to enable operations of Accountable Care Organizations (ACO) to the fact that lipids measurements should be stratified by risk factors. It seems that ONC is not solely in the business of providing tools and standards to enable the practice of quality medical care as defined by CMS, but it is actively engaged in deciding how medicine will be practiced in the future. I am not entirely certain how this transformation occurred or whether the initial intent was indeed to have Health Information Technology drive the practice of medicine. And where is CMS? Where is Dr. Berwick? By all accounts, the most experienced and knowledgeable visionary leader when it comes to quality of health care, is the new CMS Administrator, Dr. Donald Berwick. From his position as Vice President of Quality-of-Care Measurement for the Harvard Community Health Plan, to the Quality Improvement in Health Care demonstration project, and finally to the Institute for Healthcare Improvement (IHI), one would be hard pressed to find anyone better suited to guide health care quality improvements and shape the meaning of Meaningful Use. So why is it that health care quality improvements and measurements are left to the technology folks? Isn’t this where Dr. Berwick was supposed to provide unrivaled leadership for the entire nation? No matter what your opinion of Electronic Health Records (EHR) is, you would probably agree that the concept of computerizing medical records represents an innovation of sorts. 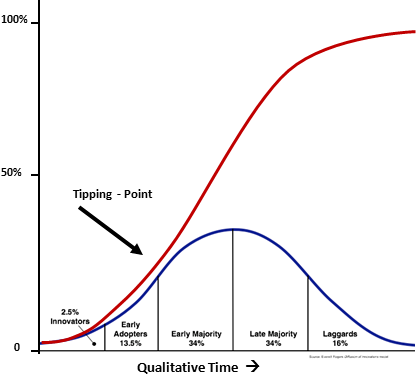 The spread of innovation, or its diffusion, has been researched and modeled by Rogers as a bell shaped advancement through populations of Innovators, Early Adopters, Early Majority, Late Majority and Laggards (the blue curve in the figure below). At some point during this spread of an innovative solution a Critical Mass of adopters, or Tipping Point, is reached and the innovation is assured widespread diffusion (Gladwell). Adoption is usually described by an S-shaped curve of adopters vs. time, and the rate of adoption is the slope of the S-shaped curve at any given time (the red curve in the figure). The Tipping Point occurs right after the rate of adoption assumes its largest value which will be maintained throughout most of the adoption process. It is worth noting that the diffusion of innovation model is not predictive. Many innovations linger and die within the Innovator circle. Another important aspect of the model is that the time variable is not constrained. Depending on the rate of adoption, it may take weeks, months or many years for an Innovation to spread throughout a given population. There is no question that EHR adoption is slowly moving up on the ascending side of a classic diffusion model bell curve, but is it moving fast enough? Is the tipping point visible? Are we there yet? In order to answer these questions and assess where we are on the path to EHR adoption, we must examine the elements affecting diffusion of new ideas, objects or practices, i.e. Innovations, as they pertain to EHRs. Relative Advantage – To what degree is the EHR perceived to be better than the practice it aims to supersede – paper charts? The daily debates on the merits of EHR in various health care forums are stark testimony to the fact that potential users are sharply divided on the answer to this question. For some, EHRs are increasing efficiency and improving quality of care for patients. For others, EHRs are impediments to quality of care and an endless money pit for the practice. The biggest advertised advantage of EHRs, interoperability, is little more than a promissory note issued by EHR proponents to prospective adopters. The Government is adding an advantage in the form of stimulus incentives and future financial penalties for non-adoption. This advantage seems to be significant for hospitals and large groups, but less so for small private practices. Compatibility – Are EHRs compatible with existing values, past experiences and needs of potential adopters? Here EHRs are being propelled onto the much larger stage of health care reform. They are no longer a humble replacement of pen & paper and fax machines. EHRs are instruments of change; a change from treating one patient at a time the best you can, to considering value-based strategies for the benefit of entire populations, and considering those right at the point of care. This seems to be a major departure from a value system created and enriched across many generations of medical doctors. Complexity – Simplicity is always a virtue. The complexity of hospital EHRs, with their unwieldy CPOE modules, has created a perception of EHRs being rigid and unduly complicated tools, which take years to master. The simple ambulatory EHRs available today, have failed to change these perceptions. To be fair, EHRs are inherently more complex than a piece of paper, but that should not necessarily deter adoption. After all, the wheel was more complex than walking, and making fire was extremely hard initially. Trialability – Experimenting with small parts of an innovation before taking the final leap reduces adopters’ risk and anxiety. EHRs can be, and mostly are, implemented in stages, particularly in hospitals. In the ambulatory sector there was a trend to implement electronic prescribing as a trial before complete computerization. Perhaps the best exercise of Trialability for EHRs is the free trials offered by too few vendors. Observability – An innovation is more likely to be adopted if its results are easily visible to others. This of course assumes that the results are positive. Unfortunately, successful implementations of EHRs are uneventful and largely anonymous, while their failing counterparts, usually associated with astronomic losses in funds and sometimes lives, are very visible, heavily advertised and frankly more interesting. There is no news in a 3 physician practice in Omaha installing a mid-priced EHR and having no problems to report. Communication Channels – The news and evaluation of an innovation are spread throughout the community by various means, from mass media to informal peer to peer communications. As every EHR vendor knows, the latter is the most prevalent and effective method of disseminating messages amongst physicians. It is also a very slow method of creating awareness and unless the innovation is indisputably positive, much confusion is created by conflicting messages from friends and colleagues, thus slowing down the diffusion process. The Government’s intervention, with all its glorious publicity and billions of dollars in support of the innovation, is doing wonders in bypassing the conventional “word of mouth” diffusion mechanism. The downside is that EHR is now associated with Big Government and a particular flavor of politics. Time – Time is involved in diffusion of innovation in several ways. On an individual level the innovation–decision process goes through five stages known as: knowledge – persuasion – decision – implementation – confirmation. In EHR industry parlance, these translate to: research – assessment – selection – implementation – adoption. The shorter the innovation-decision individual cycle is and the more people actually complete it without dropping out in its midst and the more positive their adoption experience is, the faster an innovation is expected to diffuse. For EHRs this cycle can range anywhere between a few months for a small practice to several years for a large hospital. The Government imposed Meaningful Use schedules are shortening the innovation-decision cycle for those racing to qualify for maximum incentive. Perversely, the inadequate time allowed for implementation will also increase failure rates and adverse events, which does not bode well for long term diffusion rates. Diffusion is also affected by the Innovativeness of the population targeted by the innovation. Here is where we encounter the accusations of physician being inherently opposed to technological advancements, and the counter arguments based on the number of iPhones and iPads already owned by physicians, not to mention all the advanced technologies in imaging, surgery and other medical fields, which are readily embraced by the medical community. When it comes to EHRs though, most docs don’t mind being very late adopters or even laggards. The rate of adoption dictates how much time it will take for an innovation to diffuse throughout the system. Unfortunately for EHRs, the rate of adoption is heavily dependent on the 5 characteristics of an innovation and none of those are particularly stellar for EHRs. This is why the rate of EHR adoption prior to HITECH has been lingering at the bottom of a very wide S-curve. The Government intervention, which as mentioned above is increasing the financial advantage, is making a marked difference in the rate of adoption effectively pushing EHRs up the S-curve. The Context – Innovations are diffused within the boundaries of a social system. The structure, norms and leadership of a system also affect the diffusion of innovations. Systems whose members are similar in education, social status and beliefs (homophilous) are not well suited to rapid change and innovation. Physicians arguably do form such system. The historical low rates of EHR adoption could be attributed to lack of accepted opinion leaders in general, and those who view EHRs as a positive innovation in particular. The public personas that have an MD after their name and relentlessly advocate for EHR adoption are usually not practicing physicians and as such, are not accepted as respected opinion leaders by most practicing doctors. The diffusion patterns described so far are assuming that the innovation is optional for any given individual. However, innovations are not always an individual choice. Sometimes the decision to innovate is Authority Driven. Authority driven innovations are faster to be adopted and depending on the level of coercion, may follow a completely different path. Up to HITECH, individual physicians in private practice considered EHRs optional. Those employed by hospitals or large groups were experiencing the effects of authority driven innovation all along, thus the much larger adoption rates in those sectors. Although EHRs are not yet mandatory, the increasing pressure exerted by Government incentives, regulations and penalties is changing the diffusion patterns of the EHR innovation. Keep in mind that Government exertions do not need to continue until every physician in the country has purchased an EHR. They only need to ensure a critical mass of EHR adopters is created and the mythical Tipping Point is reached. The Tipping Point is usually observed at about 15% adoption under normal circumstances and is marked by the emergence of opinion leaders who adopted the Innovation. EHRs and health care in general are anything but normal and I would expect a larger percentage of adoption to be required before EHRs “take off” in a self-sustaining fashion. As to respected opinion leaders, there are none. So are we there yet? I don’t think so, but we are awfully close. 1. Everett M. Rogers (1995), Diffusion of Innovations (Fourth Edition), New York, Free Press. 2. Malcolm Gladwell (2000), The Tipping Point: How Little Things Can Make a Big Difference, New York, Little Brown. On August 3rd President Obama announced the advent of a new button: The Blue Button. The Blue Button is a health data download button. Consumers can presumably click on the Blue Button and their medical records will then commence downloading to their computer (securely, of course). Anybody can get a complete medical record on demand; with no delays from the busy medical records department and no special fees and no rims and rims of paper records to carry around. Sounds like an awesome step forward for medical records portability. The Centers for Medicare & Medicaid Services (CMS) will make Blue Buttons available for Medicare beneficiaries and so is the Veterans Administration (VA). The Markle Foundation issued a policy paper and a challenge to developers to do something meaningful with the Blue Button data (in partnership with Health 2.0). Crunching the numbers yields about 30% of us with full electronic access to our medical records by virtue of a Blue Button. This is all very exciting and definitely warrants a closer look. The VA delivers health care and it has an EHR (VistA) and gigantic amounts of electronic medical records to share. The VA also has a website, My HealtheVet, where members can access their latest medical records, view benefits and perform simple transactions, such as requesting meds refills and updating information. My HealtheVet, which is truly a PHR, will now be sporting a Blue Button, so members can download their electronic medical records in ASCII text format. The VA has a sample download file and it looks very useful. CMS, on the other hand, is basically a payer. CMS will be adding the Blue Button to their member portal, MyMedicare, where claim data will be available for download and also, what seems to be, Self Entered clinical data. Presumably Medicare beneficiaries will update their clinical histories and then push the button to download the file, also in ASCII text format. Unlike the VA, CMS is not quite ready to allow beneficiaries to download this data to their own computers, but prefers that the data is transferred to a commercial PHR instead (e.g. Google Health, Microsoft Health Vault). Why CMS thinks beneficiaries cannot be trusted with their own data, while commercial PHRs can, or how they propose to prevent consumers from keeping copies of their own data, is a bit unclear to me at this point, but CMS “may be conducting a project called "the BlueButton"” to test the concept. As we all know, CMS is very good at pilot projects, so we will probably learn more in time. The Blue Button is a step in the right direction, but immediately exposes one big problem, a problem that has plagued health care informatics from the start. The VA Blue Button and the CMS Blue Button are creating incompatible text files. There is no common standard for the downloadable information. Fields have different names (e.g. DOB vs. Date of Birth) and different definitions (e.g. First Name, Last Name vs. Full Name) and objects (e.g. Allergies, Problems) have different subfields. If you compare the VA file and the CMS file, you would be hard pressed to guess that their intended use is identical. Any commercial PHR interested in receiving and incorporating Blue Button files will have to write two separate sets of software to process both VA and CMS files. If private EHRs and payers start adding Blue Buttons to their portals, each providing different information in different formats, we will end up with yet another bewildering array of incompatible data. Shouldn’t the parent “company” of both the VA and CMS (the Federal Government) have defined a Blue Button standard first? While the Feds work out the Blue Button kinks, I would like to suggest two other buttons that may be even more beneficial than the Blue one, and together will make quite a patriotic splash on any website. The White Button, so named for those wearing white coats while at work, should allow a physician to get all records for the patient in front of her/him with one click of the White Button. We have the beginnings of a White Button in the form of the, almost complete, medication list that can be obtained in real time from Surescripts. We should build on that concept, which interestingly enough, evolved without the support of massive infrastructure financed by Federal stimulus money. It just made good business sense and it works like a charm. The Red Button, which will hopefully be used less and less as technology improves, should allow any clinician and any patient who uses health care technology to report safety issues to the FDA, from within the software, and as they occur. Much has been written lately on the need for physicians and hospitals to admit errors, apologize and learn from mistakes. We want to measure quality of physicians’ work and pay them according to outcomes. The same logic should apply to EHR vendors. The Red Button will be our quality measurement tool and should be viewed by HIT vendors as a learning tool as well. Appropriately, the day when EHRs routinely come with Red, White and Blue Buttons will be the day we will know that HIT victory has been achieved.